Beach volleyball is fundamentally similar to indoor volleyball: a team scores points by grounding the ball on the opponents’ court, or when the opposing team commits a fault (error or illegal action); consecutive contacts must be made by different players. 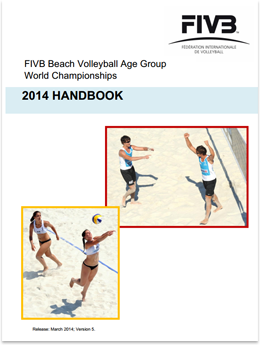 ● Playing surface – sand rather than hard court. ● The dimensions of the court are 16 by 8 meters, compared to 18 by 9 meters in the indoor game. ● The beach court has no “attack line”, unlike the indoor court, which has such a line 3 meters from the net. ● Team size – two rather than six, with no substitutions allowed. ● Scoring system – best of 3 sets played to 21 (15 for a deciding set) rather than best of 5 to 25. ● Overhand touches and tips – open-hand dinks are illegal. 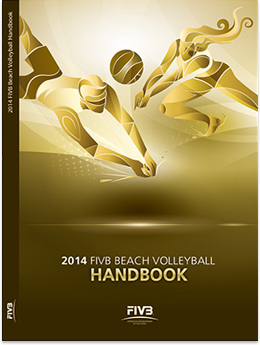 ● A block at the net counts as one of the three allowed touches in the beach game, but not in the indoor game. 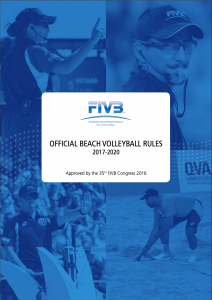 ● Open-hand setting standards are different in the beach game –double hitting is called tighter but lifts are slightly more lenient. ● Coaching during matches is not allowed. ● There are no rotation errors on the beach – players may switch sides at will. ● It is legal to cross under the net in beach volleyball as long as it does not interfere with opponents’ play. ● Teams switch ends of the court every seven points, rather than between sets. ● There is no Libero in beach like there is in indoor. The only similarity in the courts used in the two forms of volleyball is the net. In both versions, the height of the net is 2.43 meters for men and 2.24 meters for women.